I think I've basically expired from how adorable this book is. I was gleefully amused, from the very first page, when Ledi deletes what she thinks is spam mail from an "African Prince" claiming she's his long lost fiance. (Well, prince's assistant.) The descriptions of her stressful life and increasingly bizarre prince-assistant-emails are...okay, it seems rude to describe someone's stress as amusing, but it lends enough charge to the electronic exchange to have me laughing anyway. Ledi really carries this book. I adored her so much. She's got a lot of storylines to juggle in this, from struggling with her past in the foster system to trying to redefine her friendships to gaining authority in her job and, of course, meeting the hot new stranger in her life who is just so "eerily familiar." It works, of course, because everything is connected, but also because her struggles are so richly presented and matched with her wit and determination and enduring good nature. Thabiso is a little less rounded, and I felt like a few times the "he made it work because money" excuse was used too liberally. There were a lot of convoluted situations required to make the setup work, and the book used the same shortcut for all of them. 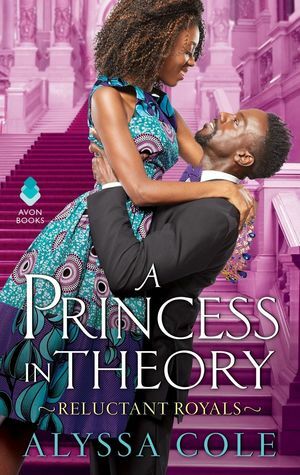 :/ Thabiso's conflicts are all about trying to juggle his own needs with those of his country, and I very much enjoyed that his spoiled-prince qualities were...very much present without being cartoonish, and without making his better nature unbelievable. That's a hard balance to get right. And the chemistry he had with Ledi was awesome. Things started to fall off the rails a bit at the end, when a Sudden Mystery was presented to...IDK, because we had a perfectly serviceable plot to begin with. To replace that plot, I guess. But it wasn't resolved to satisfaction, because it didn't pop up until the last third so it didn't have time to properly develop. Mildly disappointing, but not enough to detract from the utter charm of the rest of the novel.